After you have your sheds or garages built, of course, you want to ensure that they are protected and in good condition. Well, airplane hangars are no exception. In fact, they are special among storage sheds in Perth and they are built especially to house your aircrafts. However, the risk for fires in such structures could be a real problem, particularly for those who aren’t prepared. Luckily, there is a lot that you can do to make sure this tragedy does not happen in your hangar. Fires generally do not just happen and there is often a cause or base that makes it easier for a fire to break out. Therefore to prevent one from occurring, it is important to reduce the risk by being aware of the things that can start a fire. Make sure to keep your hangar clean from any oil or fuel spills, as these are very flammable; you and other workers should also be careful not to do anything that could potentially start a fire. In the event that something bad happens, fire extinguishers should be nearby in the hangar to swiftly take care of what could be a larger accident. When you are having your hangar first built, there are a number of extra features you could include that will offer extra fire protection. In Perth, having a proper water system to put out fires is a must in airplane hangars. In addition, there are other features you can add that will provide insulated protection. An extra door or two will provide better escape plans in the event that a fire should break out. This doesn’t prevent fires, but is safer for all should the worst happen. For those who own or are building an airplane hangar, the potential for fires is one of the biggest risks for your unit. By getting the environment clean and practicing proper safety techniques, fires can be prevented. In addition, there are a few extra features you can include on your new shed that can help reduce the risk for such incidents. 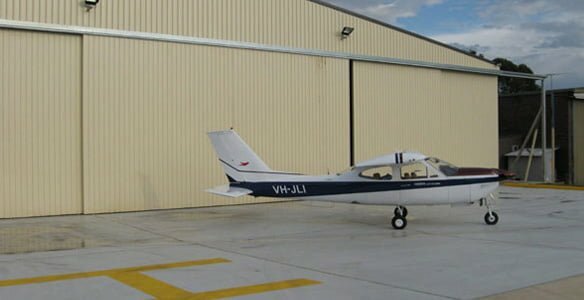 To learn more about this and to start building your new hangar or other sheds in Perth, call 1300 778 628.